September 2018 - 99s to Iceland! So I am surfing through Facebook one fine mid December afternoon and I notice that I am tagged on a post from 99s sister, Erin Seidemann. Seems she was lobing a Hail Mary to see if she could find a pilot to go with her because her travel buddy backed out at the last minute. Long story short - I have never been one to pass up an opportunity. SO when Erin made the date work with both of our time schedules we sealed the deal. Erin spent the next few days preparing the plane and the paperwork for Belize while I was assigned the duty of flight planning and weather. Our launch date is Sunday, December 17th. Stay tuned! December 17, 2017 - Belize Bound: My first leg of the Belize trip began by car. Erin had flown into Key West on Saturday to meet some friends and enjoy the Key West holiday spirit. Since I gave a survival seminar Saturday, I was unable to join her until Sunday morning. The sunrise over the runway at Tavernier was beautiful with the first waves of color peeking out beneath the clouds that stretched across the sky. The air was still cool and the humidity was low so I knew we would get out of Key West under VFR condition. I had a leisurely drive to Key West. I had not driven down that way since the storm and I was curious to see how much - or little - progress had been made. As I approached MM 40 the signs of the storm became more evident than in the Upper Keys. There was much debris still piled along the highway, boats were still laying cockeyed in the water and buildings were still in a major state of disrepair. I was happy to see that many buildings did survive. At least from the vantage point along US 1, the Middle and Lower Keys are open for business. Arrival in Key West was uneventful. I stopped at the Winn Dixie to pick up water and a little more cash, just in case, then headed to the airport to meet Erin. We did our last minute flight planning, loaded and launched. The skies were relatively good with lots of decorative clouds tossed about like someone rolling dice out of their hands. We managed to avoid all of them on climb-out and settled in a 8000’ nicely above the clouds and in smooth air. In no time at all we left behind all traces of land. This was the first trip Erin and I have taken together. We have known each other through the 99s but not well. We met several times including in Fort Worth when both of us got to fly the DC3. I read Erin’s book, Postcards from the Sky, and k ew she has a great sense of adventure and loved to travel. Hmmm .... pilot, 99, adventure seeker, traveler: the makings of a great travel buddy. For the next 2 hours 50 minutes we chatted and discovered our similarities and differences, especially since we were sharing a hotel room. What as really cool about Erin is that for all of the differences, we already had solutions worked out so we ended up with no real issues at all. Then we saw our first land! Our discovery chat turned into travel chat. After a long stretch over water land is a welcome sight! ATC was, for the most part, understandable, with minor exceptions like the controller who rerouted us because part of the airway was something-or-another. We took the rerouting and moved on to the business of planning our arrival. Forecasts were 1300’ overcast so we listened to ATIS and studied the approach plate for the ILS DME VOR 7 approach. As Erin flew, I tried to locate it in the GPS. There are 3 ILS 7 approaches: ILS 7Z, ILS DME 7 and ILS DME VOR 7. Looking in the GPS, ILS 7Z was easily identified but finding the correct ILS DME VOR 7 took a little more work. After a bit of futzing I located and loaded the approach and we were ready. ATIS noted some sort of clouds at 2100’ but other than that we could not understand if they were few, scattered or some sort of ceiling. We assumed a ceiling and prepared for the approach. As we got lower, we could see land and managed to avoid every last cloud. At 8 miles out I called “airport in sight” and we were cleared for a visual approach. Erin landed with ease and we taxied to our designated parking space as far away from civilization as they could possibly park us. Welcome to Belize!!! Having received little instruction, we sat in the plane for a bit and took the time to make notes and gather our stuff. Soon enough 2 men came out in a cart. They asked if we had a handler and Erin said we did not. My job was flight planning and weather and Erin handled everything. I knew she had talked to folks here but did not know she had not hired a handler. We were told with the handler, the immigration, customs process would be quick but without we would be here a while. We hired the handler - $75 in and $75 when we left. Cash. OK. Oh, and did we know there were overtime fees: $80. Cash. We knew about that. ..... and the arrival fee of $25. Fueling would b when we were ready to depart. They only take cash for Avgas. After “agreeing” to the fees they left us to fetch a handler. Another fellow came to “inspect” the plane after we unloaded. He left and told us to walk with our bags to immigration “over there past the tower”. We had wanted some exercise after the long flight but that was a little much. What I had thought to be as easily carry-able load was anything but. We began our trudge toward the tower. 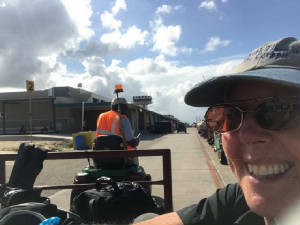 About half-way there, after what seem like the eternal walk, a kind man in a lawn mower with a cart picked up up and hauled us to the immigration terminal where the handler, Clinton, was waiting for was, paperwork in hand. We filled out the necessities and were directed to Immigration. As we rounded the corner we saw a line, actually 6 lines, packed with people waiting their turn. We were a bit surprised that this was the “express” treatment that a handler bought us. After a few minutes, Clinton came running over. He had been looking for us. He saved us from eternal Immigration and ushered us through the remainder of the process. He also hired a cab for us to get us to the ferry dock for our trip out to Caye Caulker. Erin has read that the dock was “walking distance” from the airport but we soon discovered that was not the case. The ride was easily 30 minutes and another $25. Cash. We had 10 minutes until the next ferry departed so we dashed to the ticket counter for our round trip tickets to Caye Caulker. Thirty dollars cash. We boarded the ferry for the hour long ride. We finally had some time to catch our breath and reflect on the inordinate amount of cash we were going through and we had not even been in country for an hour. I was happy to have grabbed the extra $100 because we needed it. Upon arrival in Caye Caulker we needed a hotel. There were many options within a block or so. We selected a basic hotel that met all of our needs - including accepting a credit card! At last the cash hemorrhaging has stopped ... for now. We wandered around the island after dinner to explore and digest. Nearing the hotel we passed an ATM machine and Erin decided to get some extra cash - just in case. We had calculated about the amount of cash we would need for fuel and tucked that back for safe keeping. I am sure there will be another ATM along the way if we needed it but best to make sure, at least, we had fuel to get home. When we got back to the hotel, Erin got on the internet and made the remainder of our reservation for our stay here. She had not wanted to book in advance because of the cancellation fees and not knowing if she would actually get to make this trip, especially as our going was a hail Mary anyway. December 18 - Marine Sanctuary excursion: In the quiet of the morning hours I was able to relax a bit, catch up on internet stuff, eat breakfast and wander about the island as the sun rose. The morning is cloudy so the full sunrise was initially a bit obscured. It is a breezy morning and a bit cool for me although most Conchs would find it a refreshing change. I know Erin is happier when it is not blistering hot! The “downtown” was quiet with few people, bicycles or golf carts bustling about. I found the lone vehicle on the island owned by the Caye Caulker Village Council picking up rubbish - it must be trash day. The roads are all dirt with a unique “speed bump” fashioned out of heavy marine rope. While there are street names, signs to identify them are few and far between ... not that you really need them. Everything is walking distance from the hotel just outside the heart of downtown. Walking from the far east to the far west of the island took less than 10 minutes. At the western side was the island power plant consisting of 3 semis housing massive Caterpillar diesel engines - generators, I assume - all connected with a massive amount of heavy electrical cables. It was good to see the power plant only because we tend to take electricity for granted in the US and do not think about the electrical grid when we travel. We departed on our snorkel trip promptly a 10:30. Before leaving, I decided to take some motion sickness medicine as I was not sure if I would get in the water or not. The wind had been up in the early morning hours and I did not have a high degree of confidence that the water would be warm enough for me. Hopefully, it was all a shallow protected area. Our first stop was to see seahorses. I had only once before seen a seahorse in the wild. This was opportunity number two. In a small protected cove filled with sea grasses and an old heavy fish net, the seahorses thrive. They are not strong swimmers so they have a hard time navigating big currents and rough waters. This was a perfect spot for them. From there we headed to tarpon cove where hundreds of tarpon hand out near the mouth of the cave. Both of these were sightseeing portions of the tour. We headed out toward the breaking waves for the reminding snorkeling portion of the trip. Almost immediately upon leaving the protection of he Caye, the first rougher water and rollers started. Someone called out “dolphin” and the boat swung around quickly so we could ride along side of these graceful creatures. The next stop was the manatee zone. I was surprised that the manatee were in such open waters but there they were. The group, minus me, sprinted toward the sighting spot and spent quite a bit of time admiring the gentle giant. Thy drifted down wind quite a bit so it was a long swim back. Glad I was on the boat. Next was the relatively longer ride into the marine sanctuary to see turtle, the coral gardens, shark and eel and the channel reef. At shark alley we stopped for lunch and to chum the sharks over using nothing more than the boat engines. Since we were in a sanctuary, feeding is prohibited but the sharks associate the sound of the engines with food. They obliged and gave us quite a show. 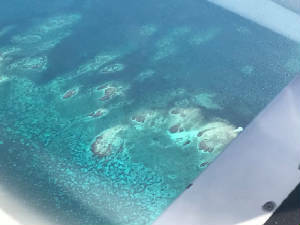 Our last stop was the barge wreck that was grossly overloaded and sank near the breakers that come over the barrier reef. The barrier reef runs 185 miles, basically, the whole of the Belize coastline and then some. In the end, it was a great day with Erin pulling her customary once per trip sickness (as she mentions in her book). She made sure this trip was no exception. We came back the afternoon so she could rest up a bit from the snorkeling. The current was strong, the waves were large and I was happy to spend the day on the boat. We headed out on the town for an early evening dinner. Food has been really good on the island. I have enjoyed fresh caught fish while Erin has found the jerk seasoned foods that she really enjoys. We will leisurely depart Caye Caulker tomorrow back to Belize City to fetch a car and explore more of this beautiful country. December 19th - Back to the Mainland: I was awake at my usual 0’dark 00 to enjoy the serenity of the morning hours. Even though sunrise was after 6:00 am, there was a long, lingering pre-sunrise glow that was particularly enchanting this morning. Once again, the haze and clouds obscured the sun as it peeked out over the horizon and the color burst of the sunrise was conspicuously missing but that did not lessen the beauty of the morning. It was still quite breezy with the flags snapping smartly in the wind. As I walked back from the beach, my upbraided hair took flight in all directions like a startled flock of birds. I had to turn into the wind to gather it all back together and get it under control. A gentleman passing by was quite amused and stopped to make a comment about “Rapunzel”. After Erin got up and had her morning run, we gathered ourselves to catch the 10:30 am ferry and bid farewell to Caye Caulker. It was a fun couple days and would be a place for me to return with warmer seas to enjoy the reef. Even with the rough seas, the ferry ride was quick and smooth. We arrived back on the mainland in short order and took a cab back to the airport. Both the boat and cab ride seemed MUCH shorter than the outbound trip. The cabbie was quite delightful and took a liking to my 99s socks. He offered to trade the socks for the cab ride. The cost of the ride was $25. I laughed and said “You would be surprised if I agreed.” He said he would but would do the deal. Little did he know that I had multiple pairs of socks in my back, clean and ready to wear. When we arrived at the car rental spot at the airport, I pulled out a clean pair of socks and a tip and handed them to the cabbie. He was delighted. For a minute, we thought we were golden. But as we started to walk away he asked for his $25. I reminded him of his deal but he decided he would rather have the money. Gladly, I took back the socks AND the tip and we headed off to collect our car. By this time we were both slightly on the starving side. The rental agent suggested the Asian restaurant. Although we did not come to Belize to eat Asian food, that was really all that was close and on the way. In the end, it was quite good and had a decidedly non-Asian taste: at least I can say that for my Pineapple Shrimp dish. We got back on the road to Orange Walk Town. Erin had read in her Lonely Planet book about a Mayan Ruin site on the way to Orange Walk: Altun Ha. It was a few km out of the way but we had time and wanted to see ruins so we took the bait. We had an amazing guide who seemed to know quite a bit, telling us he learned it from his grandfather who was one of the men who discovered the jade head -the largest piece of carved jade found. We were not sure if he was speaking the 4th language of Belize - the “B S language” - or if that part of the story was actually true. Either way it was quite entertaining. After our visit to Altun Ha, the iPad maps had us retrace our steps back to the main highway although we could see a shorter route. We opted for the shorter route only to be immediately dumped onto a rather bumpy gravel road, for me, somewhat reminiscent of Scutempaw Road out in Utah. Ellen will remember that trip very well!! After bumping and laughing our way back to the main road, we landed at our hotel for the night, El Gran Mestizo Resort. The hotel is a series of small cabins along the Rio Nuevo. I cannot say the cabins are rustic in a bad way but they are furnished something akin to what I would find in Tennessee or out west - actually quite charming. The restaurant was closed so Erin decided to head back into town for dinner. I was content with my pineapple shrimp feast (still not hungry from late lunch) and opted for a peaceful evening enjoying Belize nature. The river was still and the breeze was nil quite in contrast to Caye Caulker. The silence of the area was only broken by some occasional distant road noise and the splashing of fish. It was a great way to end another great day. December 20th - Lamanai Ruins: 0’dark 00 and all is well. The only wifi is out by the hotel bar next to the river. It is both a blessing (to have wifi) and a curse (oh, darn: I have to sit outside with a beautiful river view). The hotel is quite isolated, dark and quiet. It is still clear enough to see the stars even though a ground, or should I saw river, fog is forming. The melody of birds, crickets and jumping fish is only disturbed by the distant traffic sounds. It is amazing how well sound travels. I am hoping fo a nice sunrise over the river this morning. We are sitting at one of the myriad bends in the river so it is really a crap shoot if the river direction and the direction of the sunrise will coincide enough for some quality sunrise pictures. We will be leaving directly from the hotel on the boat tour. I am not sure how we will “check out” because the check in spot was another hotel several km away. My guess would be to drive the key back then return here to take the tour and pick up our car after we conclude the tour. I understand from Erin that our drive will be over 2hours after the tour has concluded this afternoon. It might be quite a late evening tonight. At 5:30 a van drove up and a band of chatty men hopped out to start servicing the boats parked by the hotel dock. They are the tour guides getting ready for our 9:00 am launch. For me, time for breakfast. We got a short orientation at Lamanai and the guide took us around the grounds. Lamanai is the third largest of the Mayan cities from the time and lasted for over 3000 years. 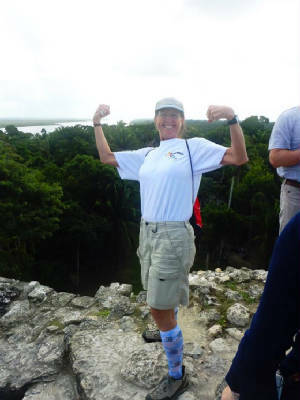 We visited several temples - Jaguar, High and the Temple of the Masks - while learning more of the Mayan history. After enjoying a Belizean style lunch we loaded up on the boat for the trip back to the hotel. 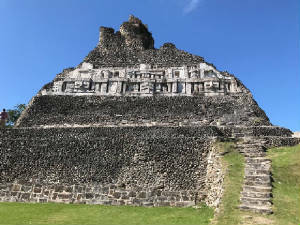 We planned on making the drive to San Ignacio this evening to stage our day for tomorrow to visit another ruin - Xunantunich - and visit the Ajaw Chocolate Factory. Other than long, the drive was quite scenic but otherwise uneventful. Looking forward to another day of clomping around tomorrow. December 21st - Xunantunish: Another beautiful morning in paradise. My usual morning ritual in Belize was somewhat complicated this morning. Everything was dark and closed when I got up at 4:20 am. Although there was plenty of light illuminating the walkways around the cottages, the public areas were dark and abandoned. No lights, no water, no microwave, no hot coffee. I wandered a bit until I located a suitable spot to sit at the bar. Once the sunlight began to filter through the hazy sky, I was able to locate a microwave and water source, neither of which worked. Shortly past 6 am, a gentleman from the kitchen staff came in and provided me with the hot water necessary for coffee and oatmeal for breakfast. I was a happy camper. It was an interesting conversation with the kitchen guy. He lived near th Guatemala border and took a cab tomwork every day. It is quite a ride and he leaves in the dark this time of year. He was telling me how cold it has been with lows in the 50’s. Belize does not typically see this kind of cold. My kind of place. My sunrise was obscured by the thick fog but the morning wqs quite nice. There were numerous birds chirping away. Had Ellen been here, she would know exactly what variety was serenading us. I snapped a picture of one bird that was kind enough to sit while I fumbled for my cell phone. The Midas Resort has lush tropical gardens and a great variety of plants, including Golden Hawaiian Bamboo right outside out cbain door. Some of the cabins are square and others round. Ours is round and was stuffed with 3 beds. A bit odd, we thought, especially when we discovered that the presence of the third bed prevented the bathroom door from closing. The problem was solved with a little creative furniture re-arranging. This is our last full day in country. It has been a great trip so far. I have enjoy the beauty of the country and hospitality of its people. I am looking forward to the last hike through more Mayan ruins and a short shopping excursion with a tour of the local chocolate factory. Xunantunich was equally amazing featuring the tallest of the temples we had seen and climbed yet, quite a few artifacts and much of the excavation farther along than other ruins we had encountered. 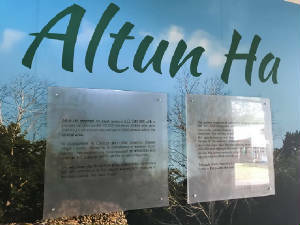 We hired a guide again and got some historical validation from the other guides and a bit more about the local area. The view from the top of the temple was amazing. It was a clear day and we could see forever and a day. We could see Guatemala and we could identify San Ignacio 12 miles away. We stopped to savor the moment and the breathtaking view before continuing on. One of the temples was used as the Mayan calendar with three sections representing the summer solstice, winter solstice and equinox. Ironically, we were there in the winter solstice which is the Mayan New Year so a celebration is in order... Happy New Year!!! We enjoyed the ferry ride back across the river and bid the area farewell. We stopped at the Ajaw Chocolate Factory to learn about the traditional Mayan way of making chocolate. It was originally only a drink, sweetened with honey. On the tour, we got to taste the chocolate from seed in the fruit, to dried seed to crushed seed, to paste, to chocolate drink, then flavored drink (cinnamon and allspice) then finally to an almost pure dark chocolate - 90%. We followed with a rum factory seminar about the local rum and spirits and how they are made from sugar cane and molasses in the distilling process. I never knew how this stuff was made into its various forms so this, too, was quite educational. The drive back found us in the middle of our first rain storm: a storm that lasted the last 50 km of our drive and through unloading the car at our hotel in Belize City. We selected the Americanized Best Western to get good internet and a good nights rest. We have a long day ahead of us flying and clearing customs back in the US. 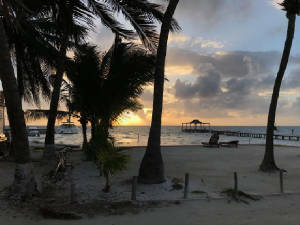 Preliminary weather looks good so we are gathering our departure cash this evening, repacking our bags and filing our flight plans .... Oops .... a snag .... flight plan from Belize to the US must be filed with the Belize authorities and not with the US. Hmmmm .... a suggestion for Foreflight to work on foreign flight plan filing but I guess this is why we are paying the handler the “big bucks”. This will be one more duty for him in the morning. December 22nd - Homeward Bound: A peaceful morning in Belize City. Sitting by the pool I heard the waterfalls into the pool in the foreground with the feint sounds of traffic in the background. There is already a nice breeze and the stars are visible so I am hoping for a no fog morning. We will be getting an early start this morning retuning the rental car and meeting our handler, Clinton, at 7 am. We are hoping for a smooth departure. I post all of the procedures for getting into and out of the country at the end so anyone wanting to create their own adventure to this beautiful country can do so a little easier. We made it to the airport a little before 7 am and promptly met Clinton. He had everything ready for us and ran us through the mill fast. I handed the handler papers and money while Erin was ushered upstairs to file the flight plan. By 8 am, we had our baggage driven to the plane, we were fueled and received our clearance. We were airborne at 8:13. The initial portion of the flight was uneventful. We leveled off at 9,000’ and settled in for some nice chatting time. After a while I noticed that I was only,listening to one side of the ATC conversation, and it was NOT from ATC. I listened for quite some time and finally wrote down several airliner numbers. I told Erin we were not receiving ATC and directed her how to check and eventually get a relay from a passing Delta flight. By the time that was all done, we were receiving a feint signal again that eventually got stronger as we neared Cozumel VOR. We were excited for this next leg as it would take us in the inner ADIZ of Cuba so we could fly over the barrier reef and along the coast line. We were handed off to Havana Center and established radar contact. As we approached the inner ADIZ we anxiously awaited the Migs off our wing tips but none came. We reported ABANN. Havana Center cleared us through. Success! This ended as a trip highlight for me. I was on the good view side and could clearly see the coast line, the coral reefs, mountains and everything. We had been flying over a funky haze that started in Belize and persisted through Mexico. As we neared the Cuban coast, the haze and any associate clouds cleared. I knew Mario was right there with me saying: “I want you to see my beautiful homeland.” It was absolutely spectacular. Even from 9,000’ the rainbow of colors from the coral reef punctuated by the cobalt blue holes was breath taking. All I could do was snap pictures and say “Wow!” Then Sierra del Rosario mountain range came in to view. Simply spectacular. I found myself overcome with emotion at the beauty of the country and the intestinal fortitude that the Cubans had to have to leave such a beautiful place to seek freedom. I WILL go to Cuba one day when all of the Castro Family is out of power. I want to take a part of Mario back to his homeland. With memories that will forever fill my heart we continued on to the US coastline and the first sight of my beloved islands that I call my home: The Florida Keys. They were a beautiful sight to behold. We made an uneventful approach and landing and taxied to customs. Key West Customs gets the customer service award of the year. They were professional, polite, courteous and did their jobs and then some with a smile. I did not want Erin to have to do an start up and taxi and quick shut down to get me 2000’ to Signature. I called Signature to get a golf cart over to fetch me and the bags so I could get the car. They refused but the kind customs folks helped me unload the plane, carry the bags in and sat with the bags while I got the car. Hats off to our government employees!!! There could be no warmer welcome home.